For those of you wondering which of his tattoos David Beckham likes best, the soccer star personally weighed in on this matter on February 6, noting that his favorite tats are, of course, the ones involving his children. You might also like to know that David will probably be getting some new ink in the future…providing he finds some room on his already heavily inked body for them. David Beckham took part in a Q&A session last week via the retail chain H&M’s Twitter account, answering a variety of questions posed by fans of the international soccer player. Among them was at least one inquiry about David Beckham’s tattoos and whether or not he plans to add to his impressive collection of ink in the future. Check it out! During the Q&A session (which was part of the launch for the model’s H&M bodywear line), a Beckham fan asked “any more tattoos planned? And which is your favorite?” The model and soccer star replied, “My favorites are the ones about my children.” Similar to other inked-up celebrities like Rihanna, Pink and Miley Cyrus, Becks has upwards of twenty tattoos inked on various parts of his body, including his arms, chest, neck, sides and back. One of David’s most prevalent tattoos is the large guardian angel he has inked in the middle of his back, which he had done in 2000 by tattoo artist to the stars, Louis Malloy. With the birth of his three boys, Romeo, Brooklyn and Cruz, David Beckham added each of their names to the upper, middle and lower parts of his back. Nine years after David Beckham inked his first son’s name on his back, the tattoo lover got another piece inked on his body in honor of his boys. On the left part of his chest, David has an ornate tattoo depicting Jesus being lifted from his tomb by three cherubs, which represent his sons. According to David himself, “…my thought of it is that at some point my boys are going to need to look after me and that’s what they’re doing in the picture. It means a lot.” Honoring his sons in the form of tattoos is obviously important to Becks, so when his first daughter Harper was born in July 2011, he couldn’t leave the poor girl out! 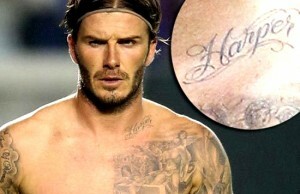 The month after her birth, David Beckham added an elegant “Harper” tattoo to his left collarbone, just above the Jesus and cherubs tat. We all know that David Beckham loves tattoos, but it’s been a good year and a half since the soccer star debuted some new ink. So, we know what you’re all wondering – are there more tattoos in David’s future? In the Q&A, David Beckham responded, “no new ones planned yet, have to find some space.” It’s true that David has covered up the majority of his arms and back with ink, but he’s got plenty of room on his chest, sides and legs. We’d love to see some more, Becks!